Indirectly, what prompted my visits in search of Wim Wenders was looking for an alternative route to Stockholm. Eighteen months ago, I had travelled with my partner from London to St Petersburg, and the route had taken the now-discontinued City Night Line sleeper service from Cologne to Copenhagen. This route can be taken on ICE trains during the day, but, with many overnight services being cut back, I was looking for something as unusual. 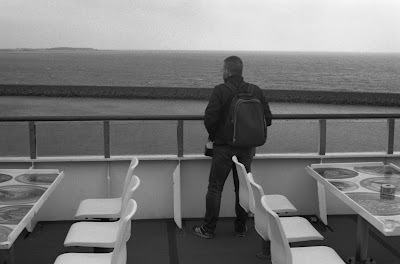 This was how I found the Puttgarden to Rødby train ferry, via The Man In Seat 61 website, which serves the Hamburg to Copenhagen ICE 33 route. There are many fewer such services than there used to be, and there have been plans to replace the ferry with a fixed link for more than thirty years, initially with a bridge, more recently with an immersed tunnel; the current projected date for this is 2021. This will cut journey times by an hour and a half. However, since the end of the Cold War, it has been argued that such a huge civil engineering project could better serve important routes further East, such as from Rostock to Gedser. The ferries which serve this route cross the 18-kilometre Fehmarn Strait of the Baltic in forty-five minutes, from the German island of Fehmarn to the Danish island of Lolland; these are connected to either mainland by a bridge and tunnel respectively. There are six train crossings each way daily, although the ferries themselves run twenty-four hours a day, departing every half an hour. After stopping at Puttgarden station, the four carriage train is driven straight onto the bottom deck of the ferry, across the roadway and a lowered ramp, sharing this deck with lorries and coaches. Cars have the deck above. 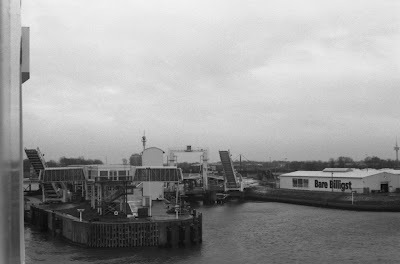 There are four actual ferries: the one I was on was the Prins Richard. 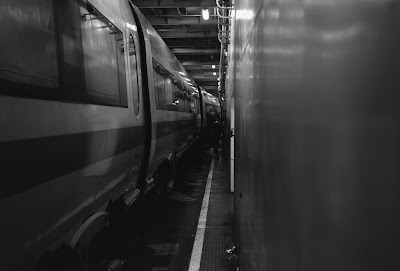 Once the train is loaded on the ferry, passengers are required to disembark and the train is locked for the duration of the crossing, meaning that bags can be left on board. The ferry has a couple of decks for passengers above those for vehicles, with all the amenities one might expect: duty free shops, a cafe, a 'Trucker's Lounge', a 'Panorama Lounge' at the front for views of the crossing. Having been on the train while the ferry was loading, I didn't get a sense of how many vehicles were on board (I could see the cars driving up the ramp to the deck above as we rolled on), and on the train deck, the train itself forms one side of a corridor with a service core containing stairways and lifts on the other, so there wasn't much to see when disembarking. 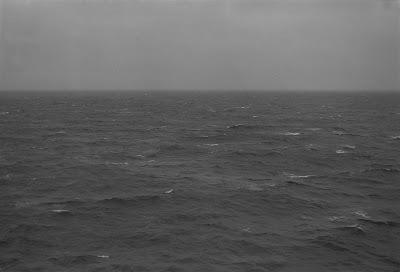 I spent most of the crossing on board the decks outside. With a strong wind and the remnants of the weather system that had provided all the rain I'd experienced the past three days, there was a little roll to the ferry's forward motion, slight, but deceptive. Most of the passengers outside were either taking photographs or smoking. As the ferry docks, passengers are required to return to the train - or their vehicles - and the train rolls into Rødby Faraege station for the onward journey. As Euroroute 47, this important transport corridor is also known by a name that reflects its position on a route for migrating birds: the Vogelfluglinie, or 'bird-flight-line'.